﻿ Free Bible Outlines - Every book of the Bible. What you'll find here is a complete outline for each book of the Bible. The format follows a very simple, easy to read "section headings" list. 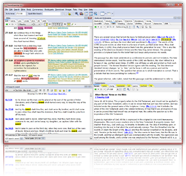 Reading through these outlines can give you a bird's eye view of the whole Bible. The content of these outlines is derived from the Treasury of Scripture Knowledge, which contained these headings on each chapter. The content has been re-formatted to make an easily comprehended summary of each chapter of Scripture.